Well even the Studebaker name was a product of the Americas. When the family had decided to leave Germany in the early 1700’s the actual name was Staudenbecker. Leaving Germany at that time was quite complicated. They were guild member blade makers in the city of Soligen. The members of the cutlery craft guild that wanted to leave had to work 5 years at another trade in a different city first. By 1736 the family was free to leave from Hagen Germany; where they had been for the required 5 year term. The group included the wives and children of 2 brothers, Clement & Peter. Another part of the group was their cousin, Heinrich and his family also. After managing to get past all the petty lords (who extracted-ROBBED- tolls for crossing their lands) they sailed for America on the Harle. Eventually they landed in Philadelphia. Well government records were as easily fouled up then as now. The name somehow came through the paper work as STUDEBAKER. These hardy Germans settled on the edge of frontier land, farming close to each other. This area was known as Welsh Run Creek. During a raid by the Delaware or Shawnee Indians in 1756 Heinrich was killed and his family captured. Peter & Clement put their skills to work blacksmithing & making wagons for the expanding settlements that were pushing past the edges of “civilization”. By this time the Studebakers were making wagons to sell to the settlers moving into Ohio. They were making the wagons one at a time and not as a company although; Peter, Clement and many of their family members were involved. The design that the Studebakers used for their wagons was called a “Conestoga” and became widely copied and famous. It was soon known as a “Prairie Schooner”. Many of the Studebakers moved west as the migration continued. When John Studebaker had moved on to Indiana 2 of his sons, Clement & Henry, formed the Studebaker Wagon Company. Their brother John M. left for California in 1853 to join the gold rush. On arrival, John decided that making as product the miners needed was better than prospecting fro gold. He made very good quality wheelbarrows. He ended up with the nickname of “Wheelbarrow Johnny!” El Dorado County Fair still has wheelbarrow races as an honor to John M. Studebaker. This is the only automotive company that I have ever heard of having initially started on 1 wheel! In 1857 another wagon manufacturer ended up with more wagons to build than their facility; could produce. George Milburr from Mishawakw Wagon Works then turned to the Studebaker brothers and sub-contracted 100 wagons to them. Another unique association of one of the Studebaker Brothers with wheeled vehicles was in California! John M. Studebaker was making wheelbarrows for sale to the mining industry that had grown up around the gold rush. The next step of the saga occurs in 1858 when John returned to South Bend, IN; buying his brother, Henry’s share of the family blacksmith business and becoming a full partner. Just before the civil war the brothers had started to make wagons. They managed to land government contracts to make wagons for the army. At the end of the conflict; they returned to civilian production. Their trademark became the “Prairie Schooner”! In 1860, the company enlarged the facility and began producing carriages as well as wagons. By 1862 they were producing other things for the army as well. They have the dubious honor of having manufactured the carriage that Abraham Lincoln took for his one-way ride to Ford Theatre, on April 14th 1865. The first 4 wheeled vehicles across the Great Plains and the American West were most likely “Studebakers”! For decades they made wagons, carriages and such. By 1868 they had become the Studebaker Manufacturing Company. This company eventually became the largest maker of wagons in the world. The wagons were even exhibited at the Paris Exposition; coming home with a silver medal for excellence of design and construction. The 1887 production of wagons topped 75,000. That took a lot of horsepower to pull! Another historic note about the company occurs during the Spanish American War. The Studebakers are challenged to build 500 wagons complete with special paint scheme for the army in 36 hours and succeeded at the task. By the turn into the 20th century Studebaker Company was eying the automotive field. Their first venture into this industry was the 1902 electric cars. As an interesting tidbit to the story; Thomas Edison was the purchaser of the 2nd Studebaker electric car produced. They always seemed to be ahead of the times somehow. As the battery technologies of the time were crippling the electric vehicles; they entered the gasoline powered market in 1904. They produced a variety of vehicles. As World War I loomed on the horizon and many factories were totally engaged in military production; Studebaker entered the war effort. Basically, if it had wheels Studebaker was making it for the military. Wagons, ambulances, trucks, field cars and even gun carriages were made. The Studebaker saga even initiated a change in our judicial code. As like many other companies; the Great Depression was going to take out Studebaker! The company executives convinced Congress that as an ongoing concern it was a greater benefit to everyone; than being closed, sold and defunct! Congress changed the bankruptcy statutes to let Studebaker keep operating. Eventually Studebaker recovered and was a valuable military contributor to World War II efforts. During that conflict, they again built almost anything with wheels. They also built airplane engines and the infamous weasels. This was an armored floating tank type machine that was used for beach assaults and rugged terrain passages. Sometime during the 30’s Studebaker had gone to Raymond Loewy’s design company for their styling. The M series trucks design had been introduced in the very early 40’s so this design was carried to postwar production. The American public would buy almost anything new with wheels under it in 1945 & 46. For 1947 Studebaker redesigned and had a wrap around back window. They introduced the famous bullet nose (which way is that Studebaker going?) design in 1950. I remember; hearing that. One of the neighbors had one and the local town yelled that at him as a joke! By the beginning of the 1951 model year Studebaker was offering a modern overhead valve, V-8 engine for general sale. The fifties were as difficult decade for the automobile industry; everyone was trying to up grade style, engineering, and the horsepower race was beginning by the1955 model year. In 1953 Studebaker rocked the American scene with it’s stunningly gorgeous Starliner Hardtop. In fact, it surprised Studebaker; they had arranged their production for the 4 door sedans. Long waits for this neat coupe sent even loyal Studebaker buyers other directions. Studebaker did not go bankrupt. They were just not getting market share enough to stay viable; as the 60’s were to be as tumultuous as the 50’s had been. From this history came some of the most advanced styled trucks in the world. 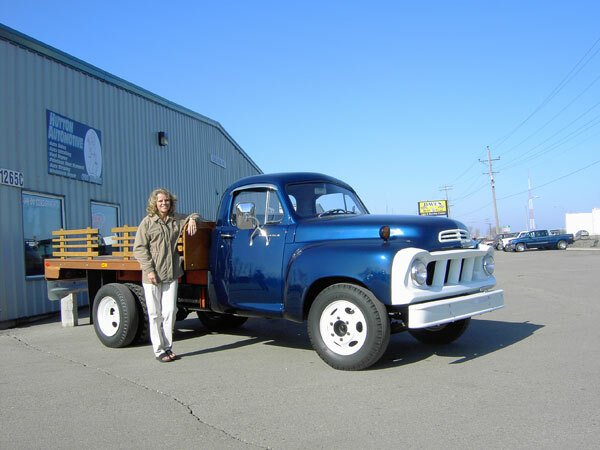 Lorrie Bratten’s 1957 Transtar is one of them. This is a very rare and fine example of the Studebaker truck line. Even the diesels that Studebaker made as part of their last “Hurrah”! were none larger than 2- ton trucks. They had made a few 2-1/2, 3, & also, a prototype 5 ton; but, these had been for military or for export only! 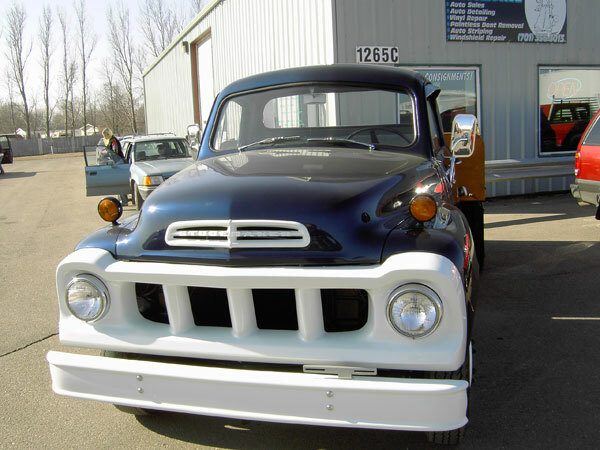 The Transtar was introduced in 1956; for 57 it received the reinforced white fiberglass buck tooth grill that many Studebaker trucks would carry for the next few years. One example of this is the 1957 Transtar 1- ton serial # E-14-2539 model # 3E14-31 (we believe these to be correct; they were extremely difficult to read.) owned by Lori Braaten of the Fargo, ND area. The 1957 model year started with serial # 2401, while they stared 1958 with #2801 for the E-14 series. She has owned the truck long enough to have forgotten exactly where, when, why, and from whom it had been acquired. The numbers identify this as a 6 cylinder 245 cu. in. engine 1 ton, with a 131” wheelbase. This is a flathead engine. It has 7.5 to 1 compression ratio. It is a little of a long stroke engine with a 3-5/16th in. bore and a 4-3/4th in. stroke. This enabled it to claim 204 ft. #’s of torque at 1400 rpm. Another of the design features on Studebaker truck engines to increase durability is a gear driven camshaft. The brochure advertised that many owners could do small repairs and all routine maintenance themselves. They were well enough designed to be able to remove the oil pan with the engine still bolted in place and service rod and main bearings from the bottom! Try that on a modern vehicle! Some require wheel removal and everything you can’t imagine to even change spark plug wires! This engine holds 5 quarts of oil, with 10-30 being recommended. It has an oil bath air cleaner, that is easily reached for service. The radiator holds 16 quarts of coolant. 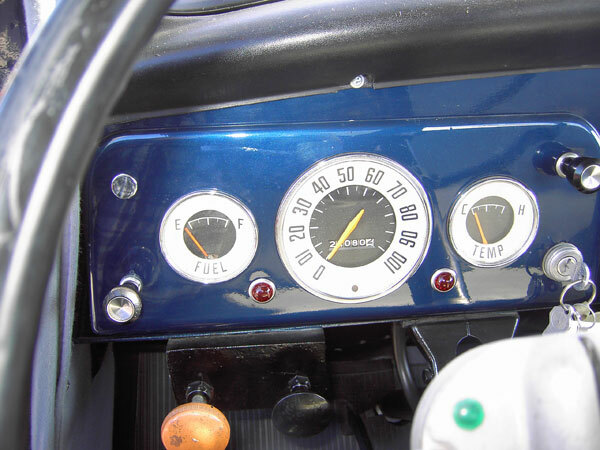 The fuel system has an A-C fuel pump, Carter carburetor, and an 18 gallon capacity tank. The 4 speed transmission is a Warner and holds 8 pints of #140 lube for high temperature areas and #90 recommended for other areas. It is a synchromesh, 4-speed, rated for, 240 ft. lbs. of torque. It has a 6.40 ratio first gear while fourth is 1to 1. The differential is Timken B-100 N-X-3. They are rated at 7500 pound load, designed with hypoid semi-floating axles, and a banjo-type housing. It holds 9-1/2 pints of lubricant with # 90 recommended. The drive shaft is a 2 piece with a hanger bearing. Studebaker had also designed the Transtar series to be maneuverable. Even with the 131” wheel base the turning radius is 22’ 5”. The steering gear that makes this possible is a Ross “cam & twin lever” type. Even the frame was ruggedly constructed. The frame side rails were 8- 1/16th tall at the thickest front part tapering to straight rails 5-1/16th at the rear. The material is 3/16th thick with 5 cross-members. Each front spring is rated for 1200 pounds while the rear ones are rated for 3340 each. The tires were originally 8:00 x 17.5 and that is what is still on the truck. They seemed to have changed the outer duals to a grip tire for some reason or another. 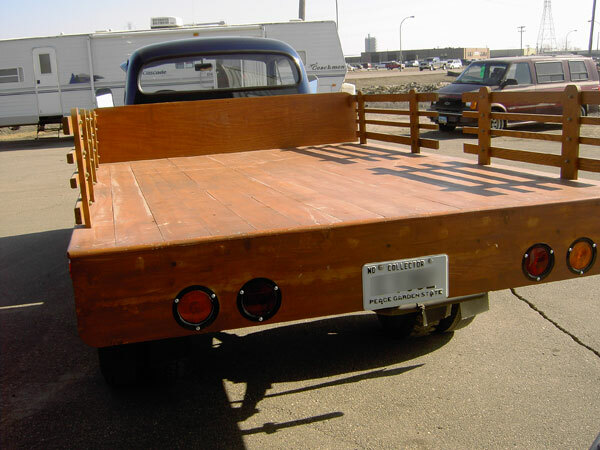 It now has a flatbed; whether, or not, a flatbed was the original configuration; is not known. Studebaker had offered a flatbed as original equipment on these trucks. 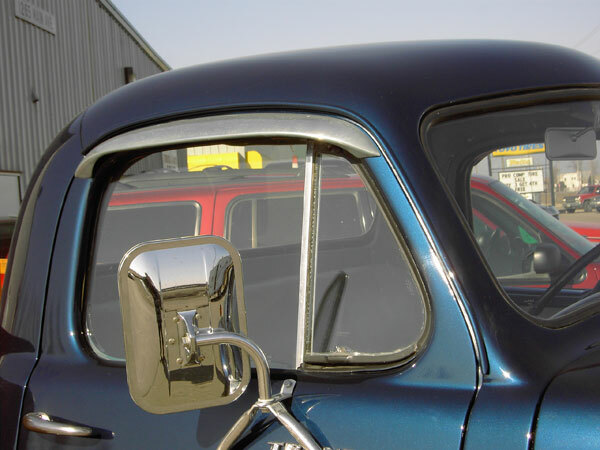 This is the deluxe cab; originally equipped with nice mirrors and really neat eyebrows over the side windows! She and her ex-husband had purchased it together. When things came apart; he didn’t want the truck and she did. So, she ended up with a somewhat battered old truck. She liked it enough to get friends to help and do the body work and painting. Many hours of personal hand sanding were done by Lori and the crew. She and her friends were doing most of the work themselves. One of the people they contacted for parts was Gary Olson of Fargo. He is known as the “Studebaker Guy!” in some of the circles, that I seem to find myself in. He was the source for the hood. Most of the parts had been with the truck, although a few had to be made. When young this truck had carried a gravel box. As most of you know the top & rear of the cab take a hailstorm of small rocks every time it is either loaded or dumped. 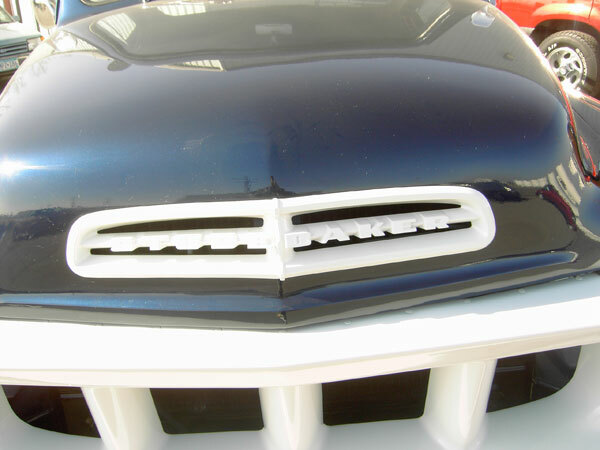 Tim Anhorn and other friends of Lori’s spent many hours priming, sanding re-spotting and then priming again and repeating the whole process to eliminate all those little dings! “It was a lot of hard work” was the comment from Tim. The color is a GM color, indigo blue metallic. Even the inside of the cab and the important detail like kick panels, door frames, and the dash were painted to match. Anyone who has done any of this kind of work knows how time consuming this detailing is! But it makes the difference between a fantastic job like this and just another paint job. Another friend did the actual painting. Another friend is Connie Hutton, of Hutton Automotive in West Fargo and she is storing the truck for Lori. The history of when the alternator was added is lost. It is the easily added Delco unit and looks like it belongs there; more than some factory alternators do, on some other vehicles. Another sad part of the story on this remarkable rolling history book chapter; is that it is for sale. Due to the circumstances, Loti has to part with her, ”Blue Star”! This article even being written owes a big “Thank You!” to of course, Lori. Also included in this list are Connie and her assistant, Mike, from Hotton Auto. Another tremendous help was “Studebaker Gary”, whose generous information and literature loan made the technical data possible. I also have to Thank Tim Anhorn for supplying some of the missing details and the fine work that is evident on this gorgeous old Stude! A special Thank You to Ralph Roggenbuck for providing this article and images.